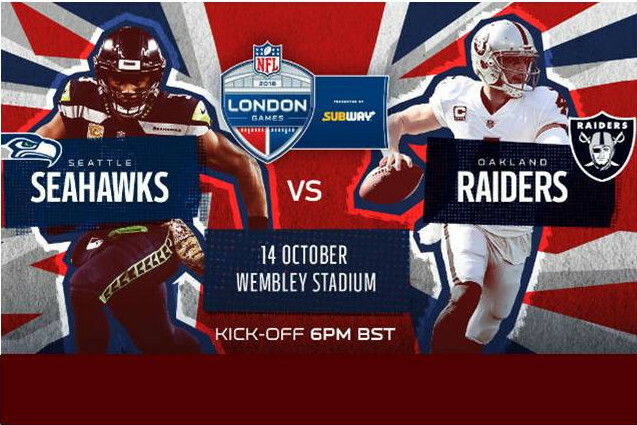 See Oakland Raiders take on Seattle Seahawks at Wembley Stadium, in the first of three NFL London Games in 2018. Oakland Raiders, who are the designated home for this fixture, return to London for the first time since their 2016 defeat of the Houston Texans. Known for their three Super Bowl victories in just seven years during the 1970s and 80s, the Raiders will have star quarterback Derek Carr and wide receiver Amari Cooper to rely on in London. It’s the first London showing for Seattle Seahawks, and it also marks the first time the west coast outfit have played a regular season fixture overseas. Founded in 1976, the Seahawks won the Super Bowl in 2014 and are known for their vociferous support. Can this be enough to give them the edge in London? Get involved and follow your team, as the NFL rolls into town showcasing a world of skills, entertainment, showmanship and athletic prowess. Tickets go on sale on 4 September.